I would like to introduce about the one of event and very first time in Myanmar. 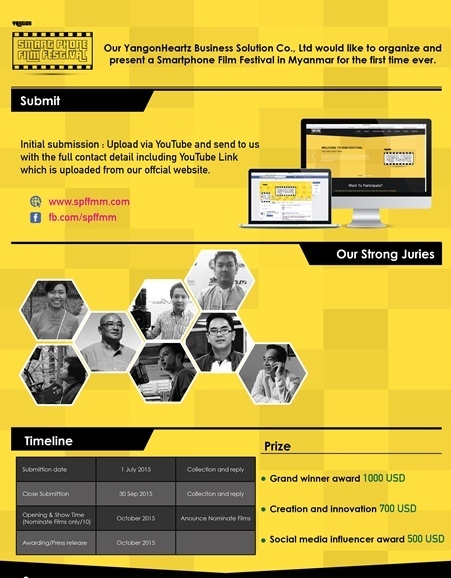 The named “Smartphone Film Festival 2015” held in Yangon. But everyone can participate wherever in country. There is the competition is not only professional, can apply amateur and open your mind. That is the chance of your creative. Everything can be filmable. Have amazing things around yours, have a message on your mind, and have a creative in your hand. Take your mobile phone and start to click. The gaming industry is rise in Myanmar?